Ok this was a fun one. It's like Conan, Clash of the Titans and Sword and the Sorcerer all rolled into one. Except that it was written over 30 years before any of those stories were a glimmer in their author's eye. 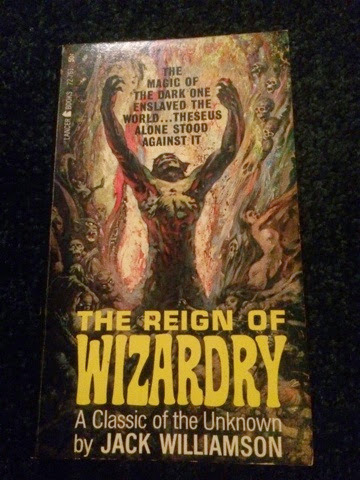 Written by Jack Williamson in 1940, it's incredible how well his writing has held up over these past decades. I felt as though it could have just as easily been written in the late 70's to mid 80's, and been a sequel to any of the aforementioned stories. Now let's talk about that fantastic cover art, as that's what drew me to read it in the first place. Classic Frazetta, it's like the creatures are alive and will begin moving with a stop-motion-like quality worthy of Harryhausen at any moment. Great stuff and a quick little read. Good twists. Available now in the Etsy Shop. OK guys, I don't want to hear any nasty tirades about what I'm about to do. 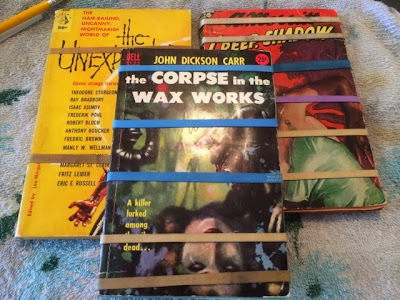 These books are from my personal collection, I bought them broken and I don't care what kind of shape they're in after Operation Fix It. Let's just find out together if this is a viable method of repair...or not. 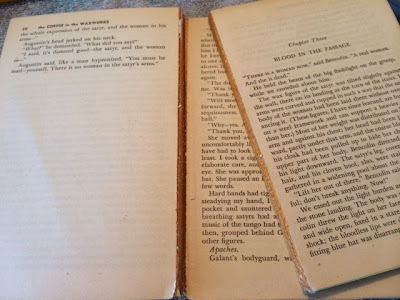 This will either be a helpful hint of one way to repair broken books, or it will show you exactly what NOT to do. Tune back in tomorrow to find out! 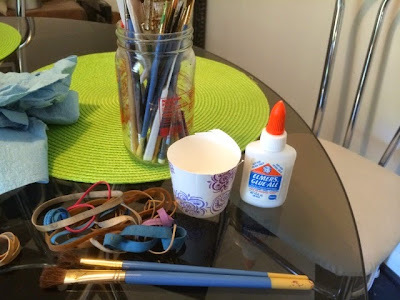 The supplies; crappy paintbrush, Elmer's glue thinned with water, wide rubber bands. Painting glue/water mixture along glue side of spine. 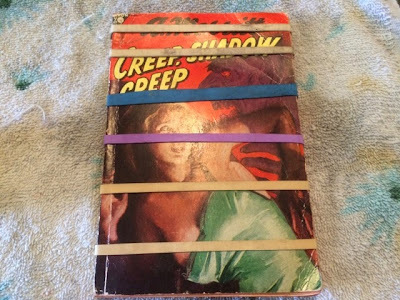 Wipe off any extra that has gotten onto opposing page edge. 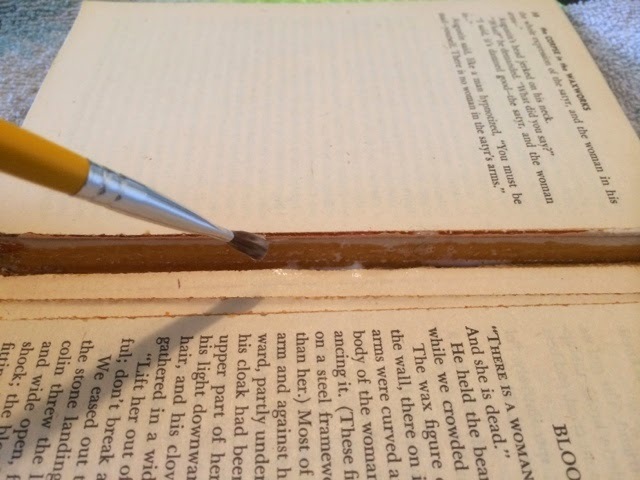 Banding at regular intervals to "clamp" glue. Be careful not to make the bands too tight to prevent bending the cover edge and/or inside pages. Come back tomorrow for the (hopefully) exciting results! 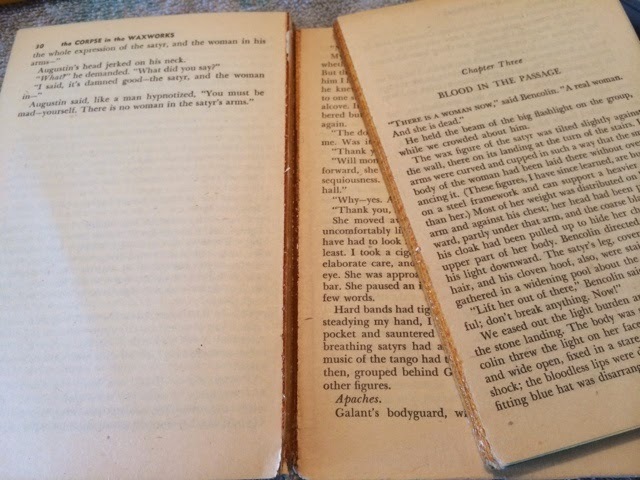 UPDATE: Well I am very pleased to say that this method has worked rather well, and I will be trying it on other broken paperbacks. 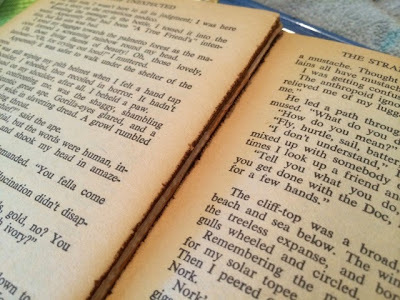 The glue seems to be flexible, but strong, and it did not discolor any pages. The next test is to see how well it holds up through a reading. Two thumbs up! 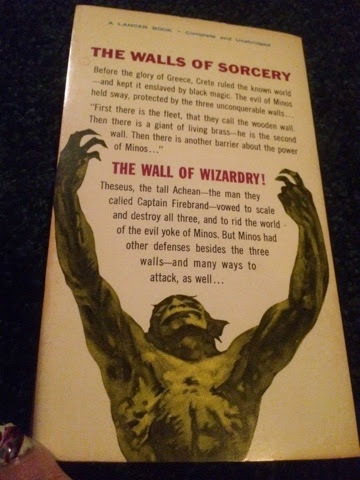 Lately, I have been absolutely obsessed with buying film novelizations as a personal hobby and new entrepreneurial venture. I miss the hours I used to spend reading, and am trying to get in at least an hour of pleasure reading a day. Which even that isn't always easy when my businesses take up so much of my time. But we make time for the things we really want to do, right? At least that's what I'm shooting for as a goal, just like writing more blog posts is a goal. Ha. Hopefully you'll be intrigued enough to take a peek at my newly re-vamped Etsy Shop, you may find something you can't live without! 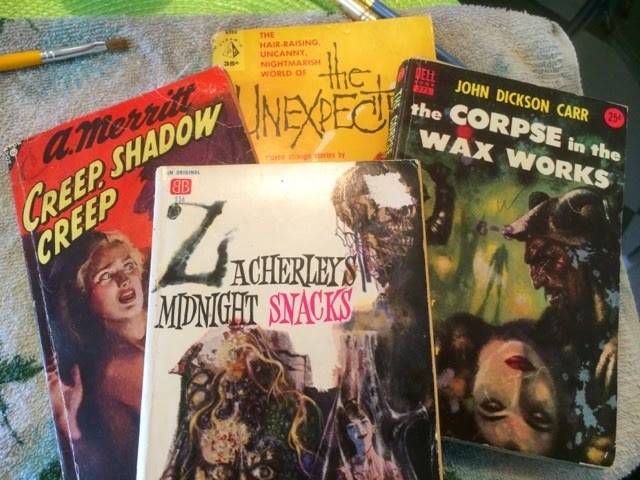 I am constantly on the hunt for vintage horror,sci-fi and pop culture books for you, so be sure to check in often. You never know what's going to cre-e-e-ep into LaCreeperie. This is the first book review I have written in a very long time, which is completely baffling to me, but there it is. It's almost ridiculous to admit I'd never really thought of it before. Here's another first; I've not finished the book yet but just had to write about this...that's how excited I am about it. I found this little gem by chance at a local Sci-Fi, Fantasy and Horror Bookstore called Interstellar Overdrive (a great little place if you're in Vancouver, WA). Lately, I've been on this huge 1970's horror kick, (quelle surprise!) and Cold Terror fits the bill perfectly--just look at that cover! Written by English author Ronald Chetwynd-Hayes in 1973, Cold Terror is a collection of short stories of the supernatural, and some are downright horror-fying. Fantastic. What's even more fascinating is that he also wrote The Monster Club (I also blogged about the amazing, and incredibly rare soundtrack on my vinyl blog) and From Beyond the Grave, two of my favorite 80's 'horror anthology' films. I can see by the massive list of his accomplishments that he is going to become a favorite author of mine, which will no doubt shortly become an obsession, as I hunt down printings of his other works. What also comes as no surprise is that many of his books are out of print, and are fetching some really high prices. That's OK, I love a challenge, and it will be worth every penny. I highly recommend picking up any one of his titles should you come across them, he does not disappoint. I wonder if Neil Gaiman knows about him? ?